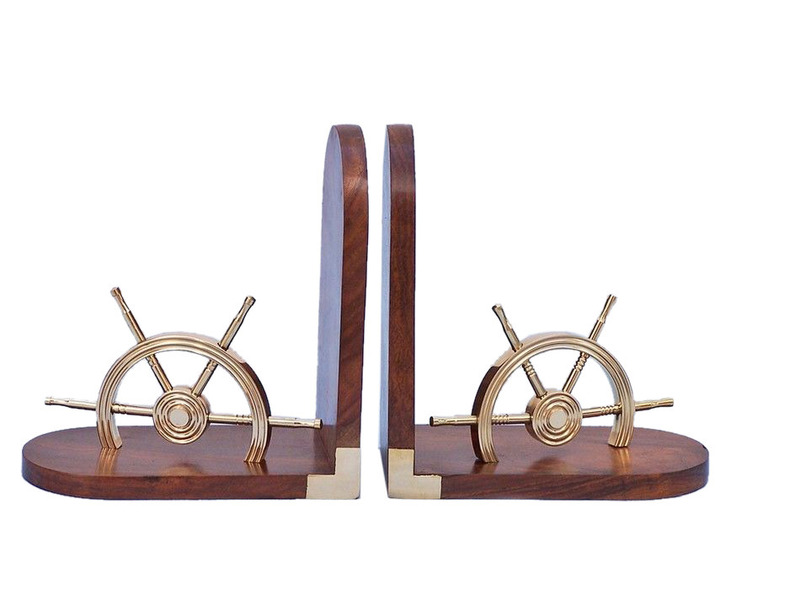 This set of 2 Hampton Nautical solid brass Ship Wheel Bookends is truly a great nautical gem and is a great addition to any bookcase. These sturdy bookends are made of rare Shisham wood, with a smooth polished finish. Each wood bookend features half of a real solid brass ship wheel on each end and L shaped brass fittings and rounded corners in the front. To protect your furniture, the bottoms are lined with thin green felt. Embodying the beauty of the sea, the magic of sailing, and the historic impact of the ship’s wheel, this ship wheel decoration is a fabulous addition to any room or office. Embrace this captains wheel decoration and place it on a shelf, surrounding your favorite nautical books, to complete the sailing theme. During 16th and 17th centuries, as ships sailed across the world in the Age of Exploration, the wheel ship took the place of earlier tiller and whipstaff designs. 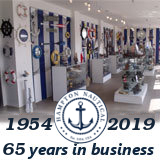 Though the British Royal Navy is credited with the invention of the ship’s wheel, it is more likely that local nautical craftsmen and artisans were actually responsible, and the iconic design of the wheel that they created is an enduring image of sailing. This ship wheel decoration incorporates the classic craftsmanship and dedication that was put into creating the ship wheel, representing a revolution in sailing both tangible and symbolic. As ship wheels developed, beautifully carved brackets became standard for mounting the wheel, while smooth handles were carved by lathe and wheel rims were adorned with traditional sailing designs. As those early symbols inspired hope, brought good fortune, and guided sailors to safe port, this ship wheel decoration will imbue you with the ambiance of the sea, an elegant addition to your nautical life.